The latest Rasmussen Reports national telephone survey of Likely Voters shows that just 19% believe the United States does enough to develop its own gas and oil resources. Seventy-five percent (75%) do not think the country is doing enough in this area. Though the left has mocked Sarah Palin for making Michael Steele’s “Drill, baby, drill” mantra a well-known phrase, Freddoso observes that this is one issue they are no longer winning. More importantly, this is one of the most compelling reasons why Sarah Palin should run for president in 2012. No announced or potential presidential candidate can match Gov. Palin’s experience in energy matters nor her record or of accomplishment on domestic energy exploration and production. Certainly none share the intensity of her commitment to make America energy secure and independent. She has tirelessly advocated for opening ANWR and the National Petroleum Reserve for drilling. As Alaska’s governor, she negotiated an agreement to develop a natural gas pipeline from Alaska through Canada to the Lower 48. When ExxonMobil failed to live up to its lease agreement to develop the Point Thomson field, Gov. Palin warned them to get to work or risk losing the lease, and that decisive action led to the first drilling at that location in 30 years. She developed and implemented a new oil tax plan that provided incentives for investment in capital development for producers. Also as governor, Sarah Palin served as the 2007-2008 chairman of IOGCC, the Interstate Oil and Gas Compact Commission, an organization of 30 member states and seven associate states which promotes the conservation and efficient recovery of the nation’s oil and natural gas resources, while at the same time protecting health, safety, and the environment. Prior to her election as governor, Palin chaired the Alaska Oil and Gas Conservation Commission, the state agency responsible for overseeing oil and gas drilling and production, reservoir depletion, and other operations on private and state-owned lands in the 49th state. With 75 percent of Americans on her side on a matter as essential to America’s economic health and security as this one, plus her unique qualifications and accomplishments on domestic energy, it’s an issue which could fuel a considerable portion of a Sarah Palin drive to the White House. Drill, baby drill, and run, Sarah, run! It would be difficult for Palin’s GOP rivals, and even her Democratic critics, to deny that energy issues fall directly into the wheelhouse of the former Alaska Oil and Gas Conservation Commissioner who went on to lead a state where almost 90 percent of the budget is funded by oil revenue. As Tina Fey might say, Palin can see oil pipelines from her house. During an appearance on Fox News last weekend, Palin nodded in anticipation and smiled confidently as host Jeanine Pirro lined up a question about what the government should do about rising gas prices. 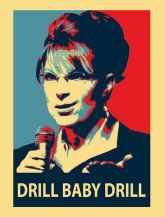 Speaking with unbridled relish, Palin replied that opening the strategic oil reserves was not the solution to the problem and reverted to her old mantra that the government should “drill here and drill now” before going into a more in-depth criticism of the Obama administration’s energy policies. As Palin continues to generate criticism from those who frequently suggest that she has not demonstrated a thorough understanding of the issues facing the country, the energy topic could offer a prime opportunity for her to prove them wrong. As she continues to mull a presidential run, Palin figures to take particular note that energy issues figure to loom especially large in the nation’s first voting state of Iowa. With the price of gas up 39 cents at the pump in a month and heading higher amid turmoil in much of the Middle East, Americans wonder why the U.S. isn’t doing more to exploit its own oil resources. They favor drilling in territorial waters, 67%-29%, according to a new IBD/TIPP poll. That is up from 61%-30% from last May and 64%-25% when Republicans touted drilling in the 2008 election as oil topped $147 a barrel. There’s also been a solid shift toward drilling in Alaska’s Arc tic National Wildlife Refuge, with support at 54%-40%. That’s up from 49%-43% last year. A solid 65%-21% favor tapping federal shale reserves in states like Colorado, Wyoming and Utah, off just slightly from May. “Americans understand we rely heavily on oil imported from the Middle East and the recent events cause concern and uncertainties in their minds,” said Raghavan Mayur, president of Technometrica Market Intelligence, which conducted the poll. Though most Americans relate to the energy issue as an economic one, Gov. Palin has often pointed out that energy trancends the economy. It is a national security issue. Our military depends on a stable source of petroleum products to fuel jets, tanks, trucks and many of its ships. When that supply is interrupted, the military can’t move. That’s why our national strategic petroleum reserve exists. It’s there for the military to draw from if its supply is suddenly cut off or significantly reduced. It’s not there to tap every time prices get near or above the four dollar level, something Sarah Palin understands, but President Obama does not. Energy security is one more reason why our nation sorely needs a national energy plan which draws on “all of the above” sources, but includes a serious commitment to explore and produce much more oil and natural gas domestically. Besides, we could use the jobs which would be created, addressing another key concern on the minds of the electorate. Sarah Palin’s opportunity of a lifetime may have just pulled up to the gasoline pump, and it has to weigh heavily on her decision to run or not to run. No other candidate for 2012 knows this issue as well as she, and it’s a club she can use to beat up on an incumbent president who has done nothing to reduce energy prices or increase domestic production, so beholden is he to the green lobby. High oil prices are knocking on that door of opportunity she has spoken of, and her time to make history may be waiting on the other side.